A pretty cold, wet day on the run from Hopkinton to Boston. The rain held off until about 30 minutes into my Wave 3 start. The wind,while forecast to be about 25-30 mph, was not particularly noticeable as it was mostly a cross wind. As always Boston was an incredible experience. The intensity of the crowds, the organization, the committed volunteers, the history, the memory of 2013 when I saw the bombs go off down Bolyston, and the dreams and efforts of all the runners all come together and were powerful every inch of the 26 miles, as well as for days before and after the actual racing. Then, the finish, the cold, the slow endless shuffle of wrapped runners towards family, friends, and some warmth from borrowed coats, sweaters and fleece. I was fortunate and so psyched to have my wife and daughter cheering me on, and I spotted them at exactly the half at Wellesley and at Kenmore Square with a mile to go. My daughter pushed me all the way to the parking garage as I was pretty locked up. My race was OK with a 3:56 with a slowdown the last 5, as usual. Really have to cross train as my hip flexors just don't do much driving forward after 18 miles. Most unusually, my GPS app and watch did not start. Maybe because I synched them to far in advance? I didn't want to pull my phone out and re sycnh on the run so decided to run without my "timing" but on feel. I went out slower than last year but a bit faster than planned but felt super enjoying the sights the whole way, occasionally and increasingly unsuccessfully trying to do mile split math based on the digital clocks which started with the elites. Great to run without the watch but not sure I will repeat that or maybe I will. So read on for my gear and more pictures. The security was intense but never in our way. Snipers on the high school roof and bomb sniffing "runner therapy" dogs throughout the Athletes Village. 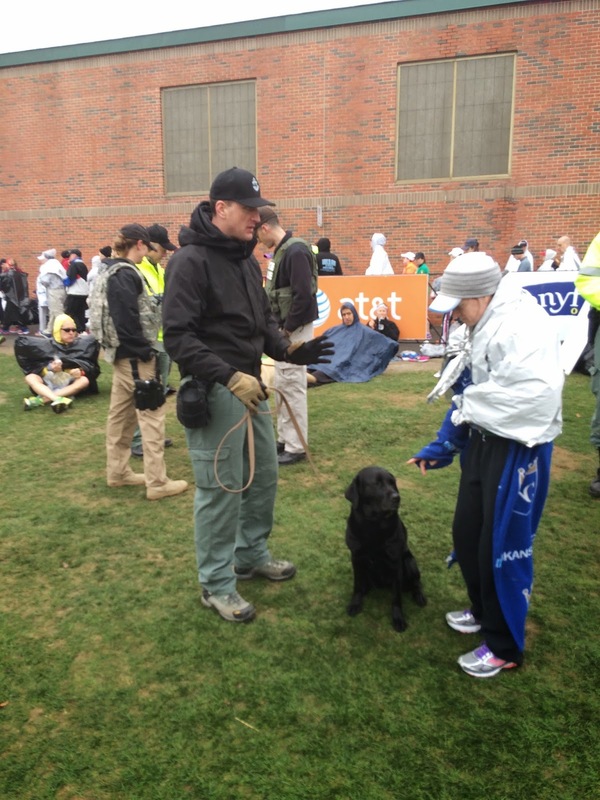 The dogs were not only working hard but provided lots of love and stress relief to any runners who came to pet them. Neat. There were of course lots of fancy signs and digital screens in the Athletes Village but I like Hopkinton's own sign best. This very small town opens arms to ten of thousands, to the world, for one morning each year, willingly and enthusiastically. Deciding what to wear was a challenge given the weather. Not the shoes, as I for once was completely convinced that the Nike Lunar Tempo was the shoe of the day weeks ago. All of my other marathons in the last 2 or so years have been in the adidas Energy Boost but after 50 or so miles there was no question I would run in the Lunar Tempo. 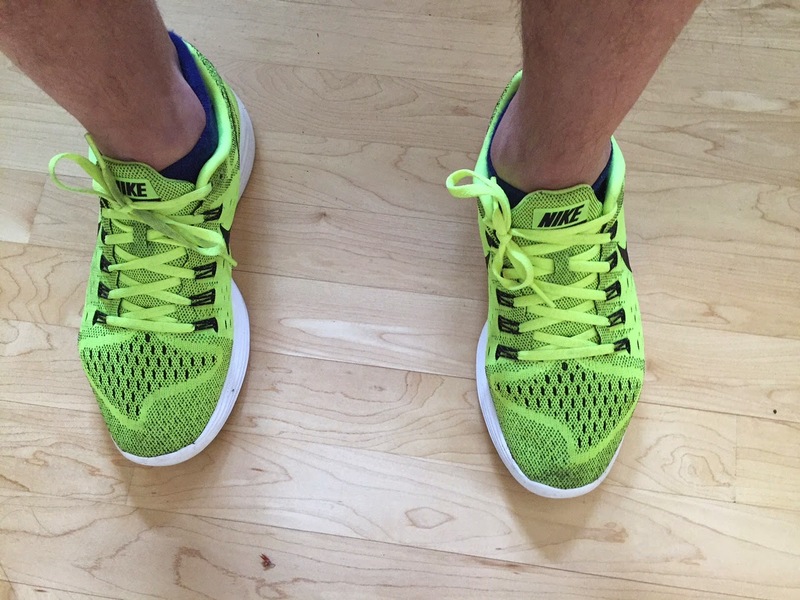 My review of the Nike Lunar Tempo here. But... I did get a true to size pair the Friday of the race as the half size up was just too big in the upper and I fiddled endlessly to try to get the right sock combination to fill just right but not too much in the tricky low toe. With my true to size Tempos and trusty Ashmei Carbon Merino trail weight socks I was perfectly shod. Never noticed the shoes, no foot cramps, no strain to toe off when tired. No blisters, plenty of cushion and super light at under 7 oz. My recovery has been very fast, far faster than for any previous marathon in the last few years. Maybe the cushion plus increased flexibility upfront didn't hammer my quads as much as the Energy Boost? 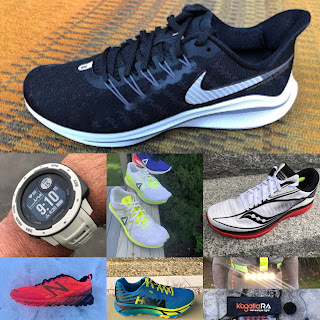 By the Sam Ratio (add forefoot and heel stack and divide by weight) the Lunar Tempo has the 2nd best cushion to weight ratio of any shoe I have tried, second only to for me the overly soft in the heel Hoka One One Clifton. With the shoes settled for once early I could obsess on what to wear on such a rainy, cold, windy day. Low and behold at the Expo I stumbled upon Compressport, a Swiss company well known in Tri circles and European ultra running for their compression sleeves, shorts, and now shirts. I was looking for a form fitting top which was warm enough and non absorbent enough that I could take the jacket off if need be and stay warm and that I could layer under my very light North Face Better Than Naked Jacket, a jacket I have had for a few years which is somehow super breathable yet wind resistant and doesn't feel like one is wearing a plastic bag. 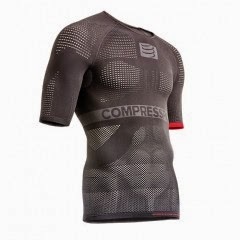 The Compressport On Off Multi Sport Short Sleeve is what I found and bought. I got white as the gray was a bit much visually...but one can see the variable knitting for differing compression and ventilation here. Much softer and stretchier than the Salomon S-Lab EXO compression. On Off was outstanding for the conditions when combined with the North Face Better Than Naked. I was never overheated or chilled as many others were. An occasional partial unzip of the jacket was all I had to do depending on wind and climbing. 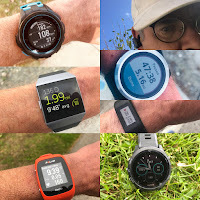 I plan to review the Compressport top and calf sleeves more fully when I can run them in hot conditions where the top is also claimed to shine. I debated wearing normal running shorts but ended up deciding for a bit more warmth so I wore the adidas Supernova Short tights. My version from last year has 2 stretch hip pockets which easily fit my 5 gels. Again, just right for the conditions. I used CEP Compression Sleeves, a bit tight and thick compared to the Compressport I want to try next. I topped it all off with a very light Swix Nordic race hat and a visor. The hat stayed on the whole race and I never overheated. Did this all make me run faster? No, but I was comfortable and decently warm the whole way from Hopkinton to Boston. Lunar tempos were nice for me, but the toe bumper was uncomfortable - just high enough that it rubbed against my big toe nails.